WRAPUP: A chilly but nice evening brought out over 30 MINIs for an entertaining drive thru the Cul de Sacs of Vernon Hills.. We were joined by several more MINIs at Superdawg for a great evening hanging out with friends. Huge thanks to Arnie and Lena for all the planning and organizing of this drive!! 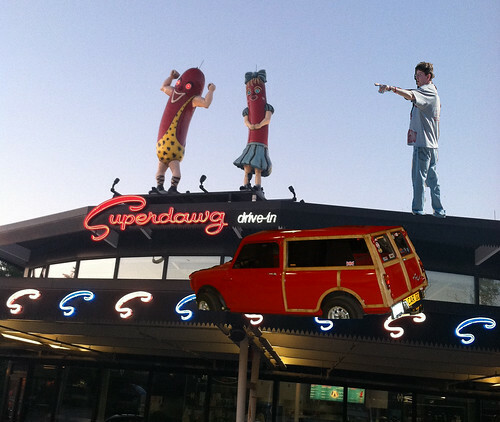 Always a club favorite event.. MINIs will be back at Superdawg on a prime time Saturday night!! We will meet up beforehand for a fun little neighborhood cul de sac drive so we can all arrive en-mass. WHAT: A hangout and a chance to enjoy some good food and MINI friends. Sherri and I will most definitely be there! I am planning on coming, but I am NOT getting on the roof again this time to help park cars. Arnie clearly wasn’t paying attention. I thought you were up there to give him a hand..
Kim, Keith and maybe Charlotte will be there for the fun! Thanks for a great event! I liked the new start point as I think it helped keep everyone together for pretty much the full drive. Thanks Arnie and Steve for planning this always great event!